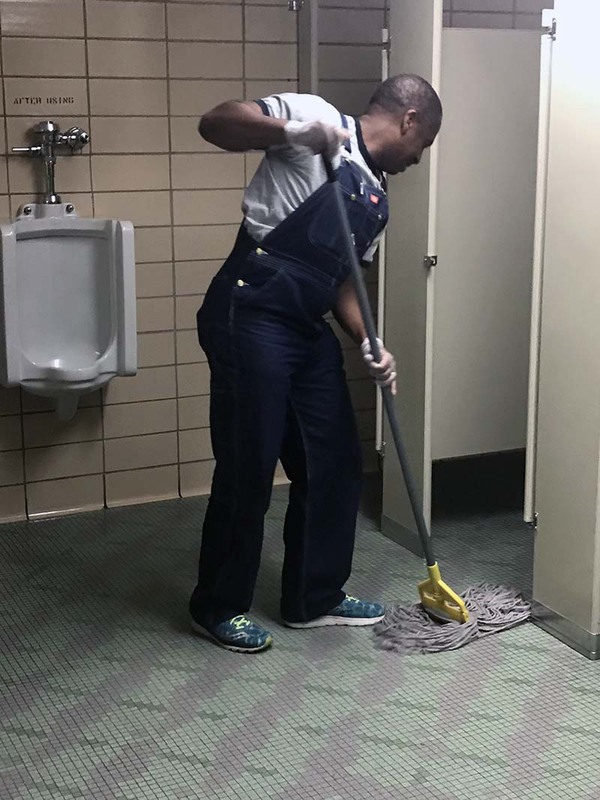 Detroit City Councilman Scott Benson mopped floors and cleaned toilets at City Hall last week. He did so to get an understanding of the reasons janitors in Detroit think they deserve to make at least $15 per hour. Benson tagged along with janitor Paulette Compass, 45, who gave him a lesson in cleaning – and an earful. Compass cleans the Coleman A. Young Municipal Center, the building where some of the biggest deals fueling the city’s resurgence are negotiated. She scoured hallways and restrooms used by the officials who negotiated tax incentives for projects such as the Little Caesars Arena entertainment and sports complex. As Benson wiped urinals, Compass inspected his work and explained that although her taxes support the arena, she can’t afford to attend events there or eat at the trendy new restaurants nearby. To make ends meet, she receives food stamps to buy groceries and Section 8 federal housing assistance to help pay rent at a house she shares with her brother and teenage son in a sketchy area less than a mile from the mayor’s mansion. The Detroit City Council on Tuesday added its voice to the state – and national – debate over the minimum wage and income inequality. The council passed a resolution, proposed President Pro Tem Mary Sheffield, that urges downtown businesses to pay workers at least $15 an hour. The resolution also states the council will consider pay of employees when evaluating projects that require public investment. The resolution is partly inspired by a deal in Milwaukee. The owners of the Milwaukee Bucks pro basketball team agreed to gradually increase wages of service sector workers at the new arena to $15 an hour by 2023. The Detroit council discussion follows last week’s launch of the SEIU Local 1 union’s “One Detroit” campaign for better pay for janitors. It is the latest effort to try to increase the minimum pay for workers in Michigan. The union expects to expand the campaign to push for higher wages for arena, airport, fast food workers and others. The “One Detroit” name refers to local debate over whether there are two Detroits – an area around downtown and Midtown experiencing a surge in development and the rest of the city, where nearly 40 percent are impoverished. Related: Foreclosed for the cost of an iPhone. That’s life in Wayne County. 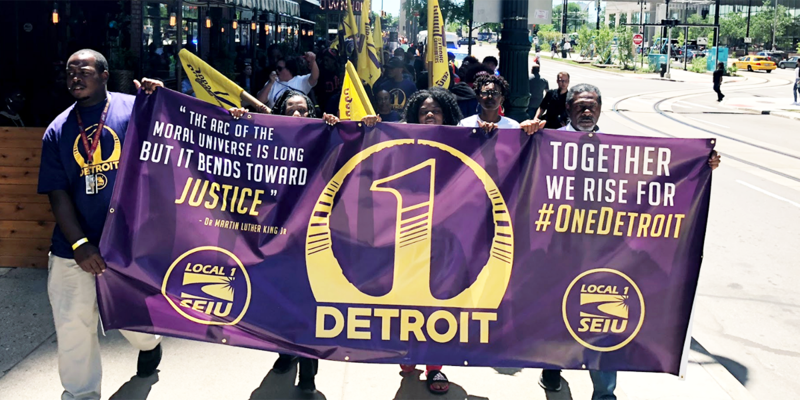 “I see the billions of dollars and the millions of taxpayer dollars going to new condos, hotels and restaurants,” said Pam Owens-Moore, an SEIU janitor who spoke at the “One Detroit” rally last week. The campaign comes as state residents prepares to vote on whether to increase the minimum wage. The One Fair Wage ballot issue will be on the November ballot, asking Michigan voters whether to increase the minimum wage from $9.25 to $10 in 2019 and $12 in 2022. The higher wages also would apply to restaurant workers and other employees who receive tips, but whose minimum wage now is $3.52 an hour. Minimum wage has been a hot issue for years, but has intensified since 2012, when New York fast food workers walked off the job, demanding $15 an hour and the right to unionize. The “Fight for $15” movement has since spread to 300 cities and lobbies for higher pay for a host of jobs from home health care aides and airport employees to adjunct professors. The movement has prompted debate about whether businesses can pay mandatory higher wages without prompting layoffs or increased automation. The Michigan Chamber of Commerce argues an increased minimum wage would make Michigan less competitive for jobs. “Michigan's minimum wage already outpaces Indiana ($7.25), Illinois ($8.25), Ohio ($8.10) and Wisconsin ($7.25),” the Chamber said in a written response to the $12 minimum wage ballot initiative. Charles Ballard, an economics professor at Michigan State University, said increasing the minimum wage to $15 an hour is too big of a leap. “My view is that a legislated minimum of $12 could be accomplished without a huge amount of dislocation in the labor market. Fifteen dollars is a much bigger stretch,” he wrote in an email to Bridge. He said increasing the wage in Detroit, but not nearby communities, could cause the city to lose jobs. “If you are talking about a $15 minimum in Detroit, but ... not in Ferndale or Livonia or any other suburban community, it’s easy to imagine jobs moving to the suburbs in significant numbers,” Ballard wrote. The federal minimum wage is $7.25 an hour, but it's higher in some states, topping out at $11.50 in Washington, according to the National Conference of State Legislatures. Minimum wages will hit $15 an hour in California and Washington D.C. by 2020. Besides Benson, council President Brenda Jones and members Andre Spivey and Gabe Leland attended the “One Detroit” rally, as did Wayne County Commissioners Alicia Bell, Irma Clark-Coleman and Martha G. Scott. “The Detroit City Council and Wayne County Commission have been very generous in approving $1 billion in tax incentives for new projects, and we believe downtown business owners should want to ensure those who pay the taxes that partially fund their projects should be able to raise their families,” Jones said. Benson, who worked as a janitor when he was a college student in the 1990s, echoed Jones’ sentiments. $15 is excessive for that work/ $31,000 per year. Some impacts may be that the company reduces size of staff and benefits. An employee's personal situation shouldn't dictate employment conditions. Article says she lives with her brother and teenage son, getting food stamps and section 8 Housing Assistance. Are they or the father contributing to the Household Income? Her facebook page says she is a Wayne State University Graduate. So, she has the skills to get into a different job that pays more that here current job. The SIEU and it's support of council people who asked the question "who say's we can't afford it" were a significant contributor to Detroit's bankruptcy. Scary to see new council people who may be in their pocket. That being said, there are many college graduates (social workers working for non profits are a glaring example) who frequently make less than $15 per hour. The minimum wage is too low, but anyone who expects to raise a family and live well on minimum wage is just as unrealistic as $15 per hour is. Average US earnings for non-supervisory workers in janitorial services is running around $12.86 an hour so far this year, according to BLS, so raising the minimum wage to $15 an hour by 2021 is not such a tall step. As boomers retire and the labor market tightens, it's going to be a moot case for most of the country, except for economic cul-de-sacs like Michigan which have more than their fair share of unemployed labor (42nd highest unemployment rate) still lingering about and inefficiently deployed. If the person now making $10 per hour is raised to $15 per hour, what about the person now making $14.75 per hour? Shouldn't that person receive $20,50 per hour? And how about the person making $20 per hour? Isn't that person now worth $25 per hour? Arbitrary increases in wages cause inflation. The one person who can't bargain for an increase is the fixed income retiree. Oh yes, Social Security gets an annual increase. But surprise, surprise, that increase is quickly gobbled up by an increase in medicare costs. You see that medical costs are rising faster than the rate of inflation, and the law dictates that social security recipients only pay the amount of their increase toward social security, thus they will never get a raise in SS benefits. Most pensions, for the lucky few, are fixed also. No, let the market dictate the pay scale. When janitors or any other job are in short supply, the choice is pay more or do without. My guess is that the robotic vacuum cleaner will be reinvented to be a restroom scrubber.